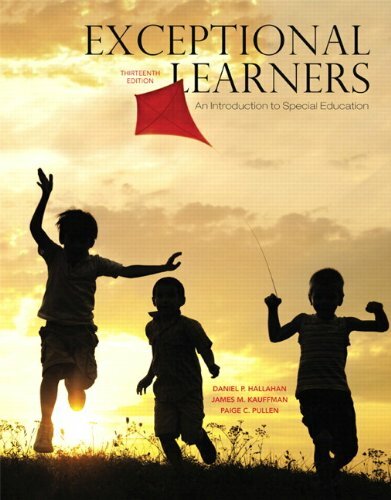 In Exceptional Learners by Hallahan, Kauffman, and Pullen, readers get an up-to-date introduction to the characteristics of exceptional learners and their education that emphasizes classroom practices, as well as the psychological, sociological, and medical aspects of disabilities and giftedness. Based on the author’s premise that professionals working with exceptional learners need to develop not only a solid base of knowledge, but also a healthy attitude toward their work and the people whom they serve, this book is designed to reach the heart as well as the mind. It asks both general and special educators to challenge themselves to acquire a solid understanding of current theory, research, and practice in special education, and to develop an ever more sensitive understanding of exceptional learners and their families. The Enhanced Pearson eText features videos, interactive links to helpful web sites, and interactive chapter assessment quizzes.